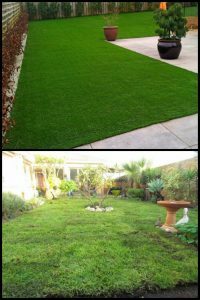 The first question that we are often asked is – “Do you really think that artificial grass is better than natural grass?” And then it is our turn to help our customers make an informed choice after understanding the difference between the two and what are the advantages of Artificial Grass over Natural Grass. 1.Look & Feel – Despite common belief, the new artificial turf products that are available in the market today are very close to look and feel of the natural turf. If you observe an artificial grass from a distance, you will not even realize that it is artificial till the time you are told so. Due to advancement in technology, it has got a very natural look and feel to it. The grass is soft and your lawn is green round the year unlike the natural lawn that turns yellow or brown due to autumn or high temperatures. 2.Maintenance Cost & Time – If you have a natural grass lawn installed, you have to spend quite a bit of time and money to maintain it. First and foremost, you need an irrigation system to water your lawn regularly. Secondly, you need to mow it down to keep it even. Thirdly, you have to use fertilizers and pesticides to keep it pest free. All this takes time and money. On the other hand, if you have an artificial grass lawn installed, you do not have to water it regularly. You do not have to mow it or fertilize it. The only time you have to spend is when you need to clean it (this may usually be once in every couple of months or once in a quarter). Cleaning again is very easy – just hose it down to remove debris and dirt. 3.Initial Cost – Although the initial cost of getting a fake lawn is considerably higher than a real lawn, a fake lawn lasts easily for about 20 years. So, if you consider the amount of money you would save on its upkeep, you will actually have a cost benefit over the real thing. 4.Safety – An artificial lawn is any day safer compared to a natural lawn. Firstly, an artificial turf has a rubber base with shock absorbing capability that ensures that even if your child falls on the turf, he/she does not get injured. Secondly, artificial grass does not become a home to bugs, pests or other creatures unlike real turf and hence is safer for your family and pets.